El Salvador is Central America’s smallest country, covering an area of 8,124 square miles (smaller than the state of Massachusetts), with a population of an estimated seven million souls. Patricia and I have had the privilege of serving our risen and glorified Lord in this country for the past 11 years. And as we look back over these years we can truly say our God is faithful. New Testament truth began to be taught in this country 40 years ago. Today there are 20 New Testament assemblies, several outreach works, and three national commended workers who work in fellowship with the foreign missionaries. We are thankful and give God the glory for what has been done in this land, but there is still a great need in spreading the gospel of Jesus Christ and teaching the Word of God throughout this country. 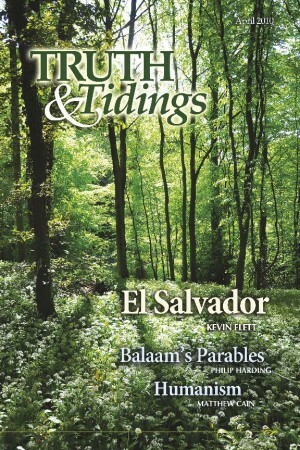 El Salvador consists of 14 departments and, to our shame, several have no New Testament testimony. There are “evangelicals” throughout this country who spread their poison of “salvation by works” like wild fire. It is much easier to witness to an “atheist” than to someone who thinks he or she is on the right road. Join us in prayer that the Lord of the harvest will continue to send His laborers to this small but needy country. Patty and I spend most of our time visiting the assemblies in the eastern part of the country. One of the assemblies that we visit on a more regular basis is Los Jiotes. It is the farthest eastern assembly, bordering Honduras, next to the Pacific Ocean. On average it takes three hours to drive the 130 miles. Los Jiotes is situated two miles off the Pan-American Highway down a very bad dirt road. The majority of its residents fish or produce salt for a living. It’s an area of about 800 homes that, in years past, was known for its extreme poverty. Over time this has changed. Just this year city water was hooked up to most homes. Our involvement with this assembly has been to help them in their gospel outreach, to teach, and to work with the young people. It’s an assembly that has been blessed over the years with many being added, young and old alike. There would be around 55 in fellowship. About 25 minutes after the turnoff to Los Jiotes, we come to the city of Santa Rosa De Lima. This is where my parents lived back in the seventies. It is also where we, as children, learned the language and culture of El Salvador. At the time we did not know God was preparing us for His future work. The assembly in Santa Rosa is one of the oldest in the country. When the war broke out between El Salvador and Honduras in 1969, all Salvadorans living in Honduras had to leave. A few Salvadoran families that had come to know the truth of gathering in the Name of the Lord Jesus Christ returned to El Salvador to establish the first assembly. In April of this year, they held their first Bible conference in over 30 years. The attendance and ministry given were encouraging to all, for which we are thankful. For the past year or so we have been helping the assembly in Santa Tecla, a suburb of San Salvador. The assembly is fairly new; they met to remember the Lord for the first time in January of 2005. Twice a week we have been trying to be with them. It’s nice helping out in an assembly close to home where we can usually attend as a family. We are thankful for the opportunity we have been given to help out in whatever way we can in the different assemblies. We would value your prayers for our work here and for the work in general in El Salvador. There is a great need to take the gospel to those who are still in spiritual darkness. However, because of the great need of preaching the gospel and the reception of it, there has been neglect in the teaching of God’s Word. As we visit the different assemblies we pray the Lord will give help so that His people will be taught and edified.